Irish crest rings have a very long history behind them. The concept of family crest rings dates back to the Middle Ages when people started creating personalized family crest rings. Today old Irish crest ring designs have been made available for the modern masses. Family crests rings are known for their beauty and practically. Back in the Middle Ages these rings were worn by the nobility of the time. The purpose of wearing these rings was to display their heritage so that they could differentiate themselves from the ordinary masses. The same concept is used even today but solely for fashion reasons. This is because the crest ring has become a classic symbol which shows an individuals sense of aesthetics. Traditionally Irish crest rings featured engraved graphics. The rings sported a heraldic image which was referred to as the crest. The most commonly used terms for the graphic are family crest, family shield and the coat of arms. Technically speaking a crest is only one element of the complete design of a coat of arms. Basically the crest is the portion that comes above the bezel, usually seen standing on top of the armor helmet which every coat of arms has. The visual imagery is derived from the costumes worn by the knights in Medieval battles. There exists a great variety of patterns in the collection of old Irish crest rings. You will be able to find them in many different colors made using a variety of different building materials such as gold, silver, white gold and platinum. Usually family crest rings are not adorned with any precious stones. Rather they feature detailed carving of the crest itself. Some of the things that you may commonly get to see on an Irish crest ring include a lion, a hand holding a weapon, a dragon, a horse, an eagle or just the wings of a bird. Each of these design elements has a whole history and meaning behind it. When they are composed together the person with knowledge of family crests is able to decode the origins of the wearer. Similarly the rings are available in different shapes and styles. For example you have the shield, signet, seal and Claddagh family crest rings. Each geographical area has its own particular historical shape. 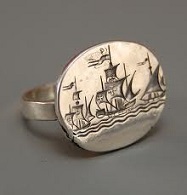 Hence if you know your place of origin you can get an Irish crest ring developed according to your heritage. While the original purpose behind old Irish crest rings was to identify the origins of the wearer, they have now been transformed into an ultimate fashion accessory. No doubt the symbolism adds some mystique to the rings but the kind of Irish crest rings you can get made today are extremely beautiful along with being practical as well. Not only are they worn by people of Irish origins, but many from the world over are intrigued by the unique looks of old Irish crest rings.